After yesterday's weather mayhem we are evaluating what to do regarding services tomorrow. As of now we're ON for the Easter Sunrise service and the 11 a.m. service. Please note that the Sunrise service will be at Marshall Presbyterian Church instead of the island. More rain is expected today, so check back here this evening for definitive answers. In the meantime, please be aware of any road closures and stay safe! During Lent, Presbyterians in Marshall and all over the country are stuffing cardboard fish with coins for the One Great Hour of Sharing offering. Again this year MPC will have a "fishing contest" with another Presbyterian Church in Texas - sharing the fun in a conference call the Sunday after Easter. 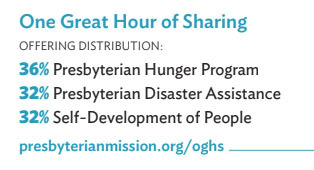 Your organization may want to apply for help from the One Great Hour of Sharing. Madison County's Neighbors in Need has been granted funds from OGHS in the past. ROAR, Rural Organizing and Resilience, is joining with Marshall Presbyterian Church and Beacon of Hope to offer lunch to the Madison County community. All are welcome. This is not a fund raiser, there is no charge. The goal is to have Madison County community folks meet, break bread, and chat with other Madison County community folks. ROAR, Rural Organizing and Resilience formed in Madison County, NC in the Spring of 2017 in response to the need for a rural voice working for all who call these mountains home. ROAR works to strengthen connections and respect among all people in our mountain communities by countering systems of oppression through education, outreach, empowerment and mutual aid. Ash Wednesday is March 6! ...and Pastor Melissa will be joining other area clergy for an Ash Wednesday service at Mars Hill University's Broyhill Chapel. Join friends, neighbors, students, and strangers in worship and receiving ashes; the service begins at High Noon. Arrive early to get a good parking space. For those who cannot make it to today's service, there will be another opportunity this Sunday, March 10, here at Marshall Presbyterian Church at 11 a.m. with Elder Carol Brown presiding. Come to the Marshall Presbyterian Church Fellowship Hall at noon and join your friends and neighbors for a delicious lunch made by loving hands of ROAR members and anyone else who brings a dish to share. Five-star food and great dining company is waiting for YOU! See you Sunday, March 3! Dicey, icy conditions around the county means the worship service for Sunday, January 20, is canceled. We know you would figuratively break a leg to get here, but we don't want it to literally happen! Stay home, stay warm, and we'll see you next week!